Here are artists who inspire their own inherent talents with other gifts from nature: a modern-day fossil maker, a wood carver with a global view, a painter of nature and emotion, and a horticultural sculptor of living art. Lisa Madson, artist and art teacher, fires up the grill in her studio—her backyard patio—to create her art. 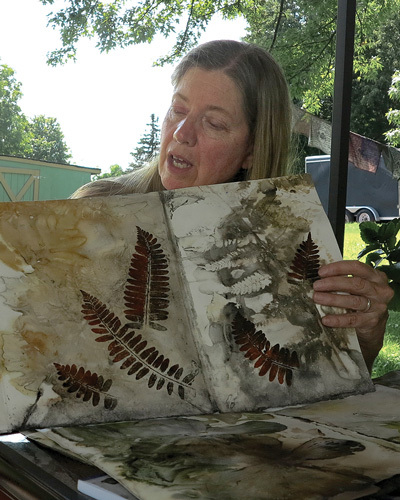 Madson transfers the colorful impressions of flowers, leaves, grass and bark and other bits of nature onto heavy-duty watercolor paper; much as nature, over time, leaves images of animals and plants on rock. From travelling to international competitions and symposia, wood carver McClain makes good friends and invites them to his home and studio to carve. He and his carvings have traveled to England, Scotland, Denmark, The Netherlands and Germany. He’s been invited to far-away places like Japan and Australia, but so far hasn’t made the trek. 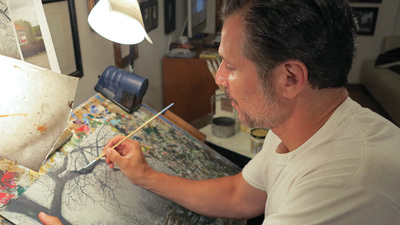 Bob Gherardi paints from the heart – abandoned houses and places of yesteryear and even landscapes that he once knew or that evoke emotion and memories. Every painting has a story. It reminds him of something—an emotion or place he has been in his own heart that he identifies with. Such is Pizza and Pinball, a painting of a place his father took him as a boy. He came across the abandoned building and rubbed the window to look inside but all he saw was debris and 2x4s in the corner and the memories that were there. Abandoned houses have unanswered questions that draw him in—a sadness but also beauty, fragile and vulnerable. Richard Kaweske created Fair Acres Farm in Wantage twenty years ago, though he began creating flower beds when he was just a boy. Today Kaweske creates sculptures made of plants and gardens from inspiration drawn from Mosaic Culture Canada, a horticultural event that combines sculpture, paint and horticulture to create living art. 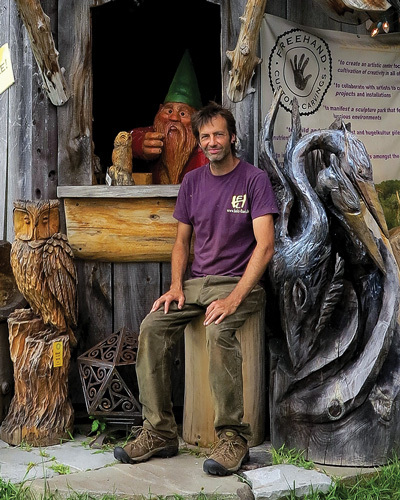 Manfred Scheel's wood carvings are likely inspiration for any artist's quest for excellence. The Bethlehem, PA, artist has been carving professionally for forty years. His background in cabinetry mixes well with a boyhood bent for drawing and painting—he conceives carving as a multi-dimensional canvas. Scheel's work encounters an electric bench tool only once, when he cuts the rough form. Then it's straight to the knife. "I'm used to it, I like it," he says. "I can cut by hand faster than a grinder. I can round them up real quick. Plus, I like chips rather than dust."